MFi (Made for iPod, Made for iPhone, Made for iPad) certified by Apple cable. Use authentic Apple connectors. Highest quality components for a higher conductivity, longer life. 3-In-1 Features: Syncing, Charging and Unique built in 64G Storage Memory Expansion. Easily Store and transfer files, photos, and videos between iPhone, iPad, iPod, PCs and Mac Computers. Support fast charge 2.4A Max - Rapid charge 2.4A max charging capabilities from the 2.4A output USB port on wall chargers or car chargers. Tangle free, high quality PU cable jacket for greater durability and flexibility. Use your Apple iPhone, iPad, or iPod while charging without the inconvenience of limited mobility. 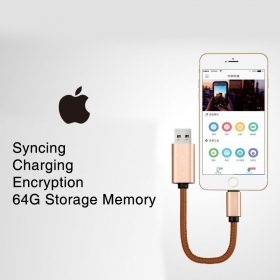 Charge, sync and store your Apple device with the latest information, pictures, movies, and apps with the LuguLake Premium Charge and Sync Cable. 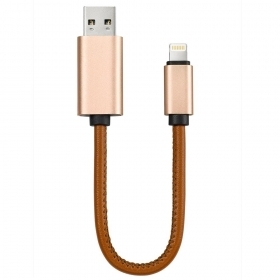 This cable is approved and MFi (Made for iPod, Made for iPhone, Made for iPad) certified by Apple, meaning that we use authentic Apple connectors. This cable provides more mobility while charging and syncing compared to normal sized cables, making it great for the car, office, or home when you need that extra cable length. 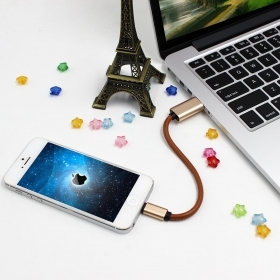 Not only to transfer the data and files, but also can be used as an external memory storage expansion cable. 3-in-1 charging, sync and 32G storage design brings you great convenient in life and work.